BOOM reached out to temple authorities who confirmed it was a mock drill carried out by the Banaskatha Police’s Special Operations Group last week. 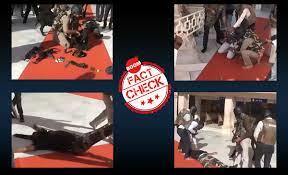 A video showing a mock drill at the Ambaji temple in Banaskantha district in Gujarat is going viral on WhatsApp and Facebook as a real incident involving two terrorists. The video, a montage of shaky hand-held camera footage, shows armed security personnel overpowering two armed gunmen inside the temple. Signboards in Gujarati can also been seen in the video. However, BOOM reached out to temple authorities who confirmed it was a mock drill carried out by the Banaskatha Police’s Special Operations Group last week. The clip is viral on Facebook with text in Gujarati which claims two terrorists stormed Ambaji temple, one was killed while another was captured alive. Click here to view an archived version of the post. BOOM also received images and the message on its helpline (+91 7700906111) asking us to verify if it was true. BOOM broke down the video into key frames and did a reverse image search. 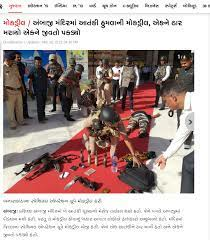 We found a news article dated March 30, 2019 by Gujarati publication Divya Bhaskar stating it was a mock drill. BOOM also spoke to Ashish Rawal, media in-charge of Ambaji Temple Trust who confirmed that a mock drill was carried out on March 29, 2019. “A mock drill was mandatory ahead of the parliamentary elections. It was conducted by the Banaskatha Police’s Special Operations Group (SOG) and headed by the deputy SP of the area,” Rawal told BOOM. Rawal also added that they temple authorities have been flooded with calls since morning and he wished to issue a statement regarding the same on the temple’s website.